Our strengthened and completely refurbished senior school block – He Atawhai was opened by Cardinal John Dew on 6 December 2017, following our Thank You Liturgy. He Atawhai is a wonderful modern learning environment with state of the art acoustic panelling, lighting, furniture and the flexibility to be configured in multiple different ways according to the teaching need. It offers two large and light interconnected classrooms that can be fully opened to create a huge single space by simply sliding glass stacker doors. There is also a separate breakout room complete with smart TV, direct access outside from one classroom to a private courtyard, two wet areas and the largest amount of storage space and whiteboards ever seen by the Architect in a school! 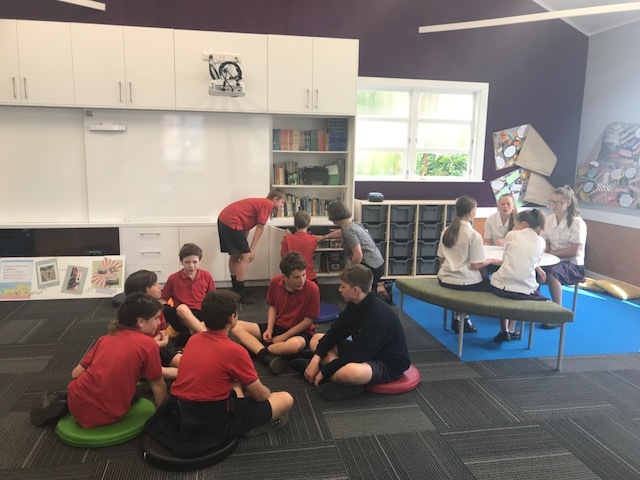 The classrooms are equipped with completely new Furnware furniture offering a range of ways for students to work – whether standing at high tables, creating work groups with low tables that can be jig-sawed together in many different ways, or sitting on lily-pads. A new wooden cross has also been hung on the outside of the building as a koha from Carroll's Joinery and JWT Construction. It signifies Kindness and Mercy and provides an outward sign of our Catholicity. The Archdiocese of Wellington, Silverwood Architects, JWT Construction and Possenniskie Consultants Ltd worked seamlessly together to create this modern learning environment at St Anthony’s and it will provide many students with a supreme place to learn for many years to come. The outstandingly large amount of money that has been invested in He Atawhai by the Archdiocese of Wellington is a true act of kindness. A true act of kindness comes with no strings attached, no instructions – just faith that the kindness will make things better. There is no doubt that this stunning new space will make the educational lives of many children better. He Atawhai was gifted in kindness and we hope that it will be a place where kindness is practised every day. If kindness can become the heartbeat of He Atawhai, then our hope is that Mercy will be its soul. Mercy reflects our starting point as a school founded by the Sisters of Mercy. Like kindness, Mercy is a no strings attached, faith-based gift. So, the St Anthony’s Board of Trustees chose the name He Atawhai because this is the Maori noun for both Kindness and Mercy. · Both Kindness and Mercy shift the focus from self to others.